1st Sgt. Peter A. McKenna was a native of Bristol, Rhode Island. He first entered the U.S. Army in 1998 as an Infantryman. Upon completion of basic training at Ft. Benning, George, in November 1998, he was assigned to 4-31 Infantry at Ft Drum, New York. In 2000 he attended Special Forces Assessment and Selection and was assigned to 1st Special Warfare Training Group to attend the Special Forces Qualification Course as a communications sergeant. Upon graduation of the Special Forces Qualification Course he was assigned to C Company, 1st Battalion 7th SFG (Airborne) until December of 2007 when he was assigned to C Co 3rd Bn 7th SFG (A) as a communications sergeant. Then in February of 2012 he was assigned to A Co 1st Bn 7th SFG (A) as a Team Sergeant. 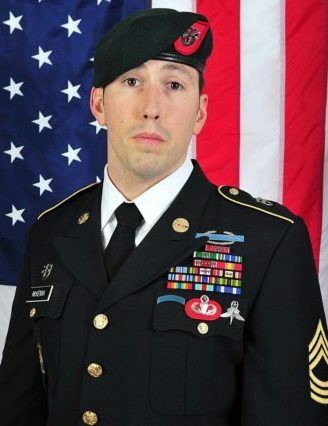 Upon completion of his Team Sergeant time, McKenna volunteered and was selected for duty as the First Sergeant for the Special Operations Joint Task Forces – Afghanistan. McKenna’s formal military education includes: Infantry One Station Unit Training, Basic Airborne Course, Air Assault course, Special Forces Assessment and Selection, the Warrior Leaders Course, the Advanced Leaders Course, the Senior Leaders Course, the Special Forces Qualification Course, Special Forces Communications Sergeant’s Course, the Survival, Evasion, Resistance and Escape course, Special Forces Advanced Urban Combat Course, the Infantry Mortar Leader Course, Special Forces Advanced Reconnaissance, Target Analysis, and Exploitation Techniques Course, Jumpmaster, Military Freefall Parachutist Course, and Military Freefall Parachutist Jumpmaster Course. Additionally, McKenna earned a Bachelor’s Degree in Strategic Studies for Norwich University in 2015. McKenna’s awards and decorations include: the Silver Star, the Bronze Star Medal for Valor, the Bronze Star Medal fourth award, the Defense Meritorious Service Medal, the Purple Heart, the Army Commendation Medal second award, and the Army Achievement Medal. the National Defense Service Medal, the Army Good Conduct Medal fifth award, the Global War on Terrorism Service Medal, the Global War on Terrorism Expeditionary Medal, the Armed Forces Expeditionary Medal, the NATO Medal, the Army Service Ribbon, and the NCO Professional Development Ribbon third award.. He also earned the Master Parachutist badge, the Combat Infantryman Badge, the Air Assault badge, the Freefall Parachutist Jumpmaster badge and the Special Forces tab.